A few years back, we at Xcore Nutrition took the sports supplements world by storm with our revolutionary 100% Whey Hydro Isolate. Now, we've taken what was already exceptional to a whole new level of excellence and came up with the most advanced and purest hydrolyzed whey protein isolate yet: the brand-new 100% Whey Hydro Isolate Sport Series. THE BEST-TASTING PROTEIN SHAKE YOU'VE EVER HAD. THAT'S A PROMISE. Each serving of 100% Whey Hydro Isolate Sport Series delivers up to 27 g of premium whey protein and more than 6 g of Branched-Chain Amino Acids to fuel your anabolic processes. To tell you the truth, our proteinpowder actually contains 27 g of BCAAs, the highest BCAA content per 100 g available on the market! For added support, especially during muscle recovery, this formula was strengthened with Glutamine. The resulting super high-protein product will definitely not only help you build more muscle, but also maintain that hard-earned mass, giving you the tools you need to get stronger every day. In addition to a complete amino acid profile, Xcore's 100% Whey Hydro Isolate now provides Creatine Monohydrate, as well as a comprehensive vitamin spectrum. In short, it's loaded with muscle fuel and true nutrition to take you to the next level and further. 100% Whey Hydro Isolate leads the ranking for digestibility. It features the patented complex DigeZyme®, a blend of digestive enzymes that includes amylase, protease, cellulase, lactase and lipase. These enzymes are resistant to gastric juices, helping break down protein during digestionand thus enhancing their utilization by the body and ultimately by your muscles. Plus, easier digestion will keep bloating at bay and reduce other gastrointestinal problems commonly associated with whey protein intake. We start by using the highest quality whey protein there is, and filter out most fats and sugars. Fats can compromise the digestive process because they get in the way of protein digestion and hinder your protein absorptionrate. Combined, excessive fats and sugars hurt definition and prevent you from getting the lean, hard, muscular body you're working so hard to get. 100% Whey Hydro Isolate was thoroughly filtered, resulting in a pure whey product capable of giving you superior results in terms of digestibility and muscle definition. With virtually no sugars, 100% Whey Hydro Isolate is also the perfect whey protein to build lean muscle mass and help you achieve remarkable results during your cutting phase. Once it has been isolated, it is hydrolyzed. This process makes 100% Whey Hydro Isolate completely bioavailable. Bioavailability concerns the efficiency and rate at which nutrients are metabolized in the body. 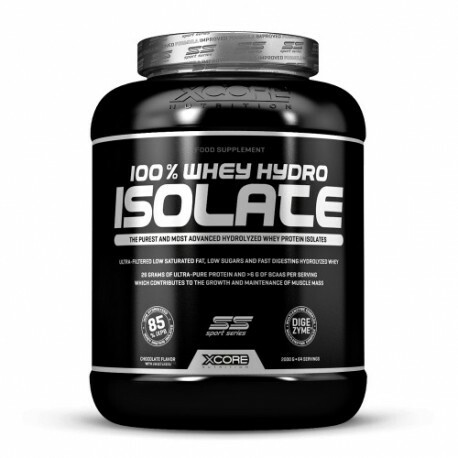 100% Whey Hydro Isolate is the most bioavailable product of its kind. 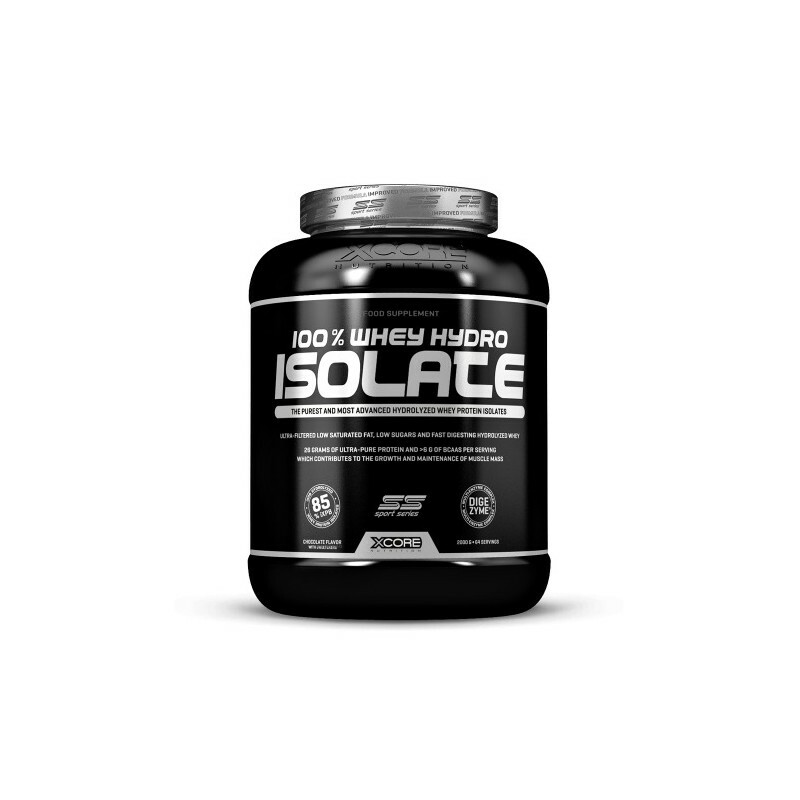 Unlike other proteinproducts, of which the poor bioavailability results in a significant waste of protein, 100% Whey Hydro Isolate is 100% bioavailable and efficient, meaning one scoop will get you more protein than any other whey proteinpowder. After being hydrolyzed, 100% Whey Hydro Isolate is further enriched with micronized BCAAs and L-Glutamine, providing an unparalleled amino acidprofile. Then, we fortify this already powerful formula with digestive enzymes from the Multi-Enzyme Complex DigeZyme® to enhance its utilization. Finally, for that extra edge, we add everyone's favorite Creatine Monohydrate and 12 essential Vitamins, including vitamins C and D, for a true nutritional power bomb. Unlike other protein powders, which blend several different protein sources in their formulas, 100% Whey Hydro Isolate Sport Series provides only the most highly available protein source: whey protein. • Beta-lactoglobulin - High in essential and branched-chain amino acids (BCAAs). • Alpha-lactalbumin - Significant source of the essential amino acid tryptophan. • Immunoglobulins - Rich in the amino acid glutamine. • Lactoperoxidase - With enzymatic properties that support the breakdown of hydrogen peroxide. • Glycomacropeptide - Supports overall serum amino acid concentrations, being relatively high in isoleucine and valine. • Bovine serum albumin - Large-sized globular protein with a good profile of essential amino acids. Contains milk and soy. May contain traces of wheat and egg. iXPB - Isolated Peptide Fusion (85%) (Whey Protein Isolate, Whey Protein Concentrate, Whey Protein Hydrolysate, BCAAs 2 1 1 (L-Leucine, L-Isoleucine, L-Valine), L-Glutamine), Creatine Monohydrate, Fat Reduced Cocoa Powder, Flavorings, Creamer (Milk), Thickeners (Guar Gum, Xanthan Gum), Sweetener (Sucralose), Emulsifier (Soy Lecithin), Vitamins (L-Ascorbic Acid, DL-Alpha-Tocopheryl Acetate, Nicotinamide, Retinyl Acetate, Calcium D-Pantothenate, Cholecalciferol, Pyridoxine Hydrochloride, Thiamine Hydrochloride, Riboflavin, Pteroylmonoglutamic Acid, D-Biotin, Cyanocobalamin), Salt, DigeZyme® Multi-Enzyme Complex (Alpha-Amylase, Neutral Protease, Cellulase, Lactase, Lipase) . To make one serving, add 1 heaping scoop (31 g) of powder to 200-220 ml (6.8-7.4 fl.oz.) of cold water in a shaker cup or blender. Mix vigorously for a few seconds. Scoop inside container. With sweetener. Do not use if pregnant or nursing. This product is not intended to diagnose, treat, cure, or prevent any disease. This product should not replace a varied and balanced diet and a healthy lifestyle. Do not exceed the recommended daily dosage. Discontinue use and consult your doctor if any adverse reactions occur. Keep out of reach of children. Store in the original package in a dry place, avoiding excessive heat, moisture and direct sunlight.